White animated snowflake projection light. New and unused. VidaXL LED Net Lights Indoor Outdoor IP44 230x110 cm. Designed with 8 different lighting effects; combination mode, waves, sequential mode, slowly glowing mode, flashing, crossfade, twinkling and continuous lighting, the net lights will beautifully light up in your preferred pattern. Top Craft Categories Coloured Card and Paper Fabric Paint Gift Kits Paint by Numbers Pottery Tools Sticker Books VIEW ALL. SET OF EIGHTY RED BERRY CHRISTMAS LIGHTS. 80 RED BERRY LIGHTS. CHRISTMAS TREES & LIGHTS. 160 red berry led Christmas lights. Indoor and Outdoor Use. Outdoor & Sport. 21m Length. If they are still unsuccessful they will either. Create a magical scene in your garden with this 2D LED unicorn. 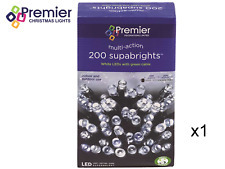 Includes Warm static lights 32 ice white LED lights that creates a twinkling-effect. Suitable for indoor and outdoor use. 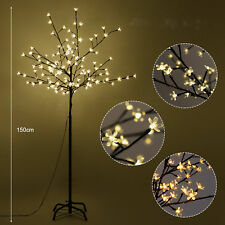 Type of Lights: Twinkling LED Lights. Absolutely fantastic inflatable decoration for over your door, the packaging states indoor or temporary outdoor use, I think it looks spectacular! The lights consist of 180 high-powered LEDs, which are very energy efficient and emit a bright white light. This lovely Christmas decoration is water resistant and therefore suitable for both indoor and outdoor use. The light string is equipped with 400 high-powered LEDs, which are very energy efficient and emit a bright light. This lovely Christmas decoration is water resistant and therefore suitable for both indoor and outdoor use. 3D Hanging Lantern Silhouette Rope Light. Add the WOW factor this Christmas with this beautiful outdoor light up decoration. For indoor and outdoor use. “HAPPY CHRISTMAS”. Non-replaceable micro bulbs: 6.5V/70mA/0.455W. 180LED to 960 LED plus optional remote! Blue and white LED rope light star. Suitable for indoor and outdoor use. Suitable for both indoor and outdoor use. Colour: Blue. Clothing & Footwear. Lead wire from plug to first bulb - 3m. Baby Products. 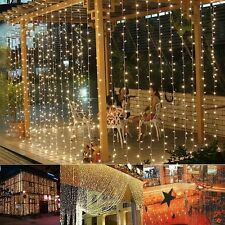 Connectable Mains 10m 100 LED Globe String Lights Fairy Starry Light 8 Modes Garden Xmas Party. 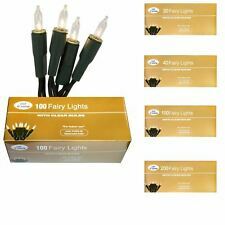 1X Fairy String Light. String colour: Transparent/clear. Excellent Illumination - 100 Warm white led bulbs create excellent illumination and a warm atmosphere, spreading light and cheer across a wide area. Connectable: Yes. Notifications: This lights are coming with connectable tail plug. 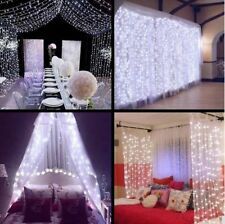 3M Multi Function LED Hanging Light Curtain String Fairy Lights Xmas Wedding Wall. Plug Standard: UK Plug with fuse. Snowflake 40cm Indoor/outdoor Light Decoration by Premier. 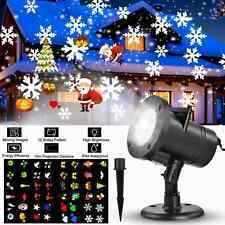 Xmas Decoration Starter Kit Laser Projector, 3M xmas banner, snowflake 20 items!